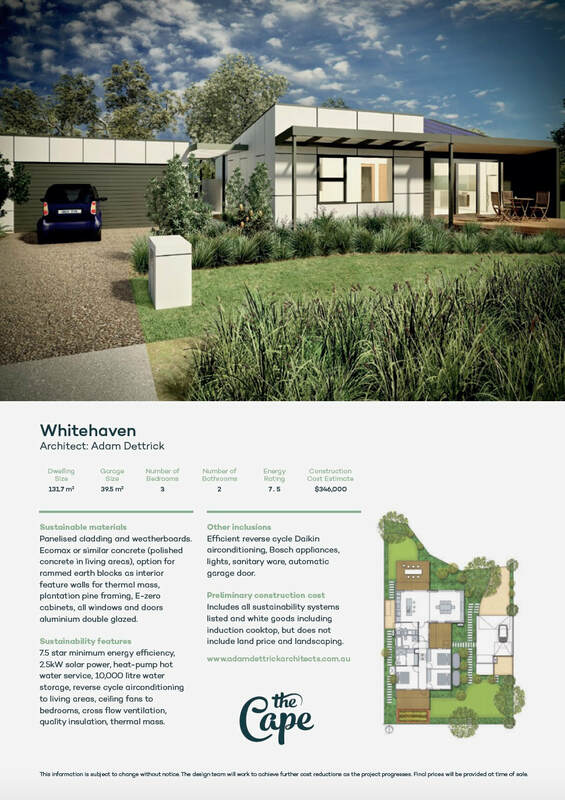 Sustainable materials: Panelised cladding and weatherboards. Ecomax or similar concrete (polished concrete in living areas), option for rammed earth blocks as interior feature walls for thermal mass, plantation pine framing, E-zero cabinets, all windows and doors aluminium double glazed. Sustainability features: 7.5 star minimum energy efficiency, 2.5kW solar power, heat pump hot water service, 10,000 litre water storage, reverse cycle airconditioning to living areas, ceiling fans to bedrooms, cross flow ventilation, quality insulation, thermal mass. Other inclusions: Efficient reverse cycle Daiken airconditioning, Bosch appliances, lights, sanitary ware, automatic garage door. Preliminary construction cost: Includes all sustainability systems listed and white goods including induction cooktop, but does not include land price and landscaping. Disclaimer: This information is subject to change without notice. The design team will work to achieve further cost reductions as the project progresses. Final prices will be provided at time of sale.